It's been a bit of a quiet week after the rush of excitement that was the High Elves release. I've had three games over the last week - beating then losing to Mike's Lizards; and going under the wheels of Ryan's Black Knight bus. Such was my dismay with the game against the VCs that I immediately placed the blame on my dice and ordered 48 new ones from the UK (Chessex 16mm from The Dice Shop). These arrived yesterday and I used them last night against Mike. Not a great improvement. It will get expensive buying new dice each week so I need to Just Play Better. Purchased three metal Screamers off TradeMe. They arrived today and I threw them into the Ultrasonic Cleaner and have stripped them back to bare metal. Decided this week to paint up new terrain for Horned Rat Gobbo. So started on a Tabletop World Windmill. This will be sited on a resin hill similar to my Watch Tower. I also have three of their houses to do and I'm aiming to have them finished by the end of the month. 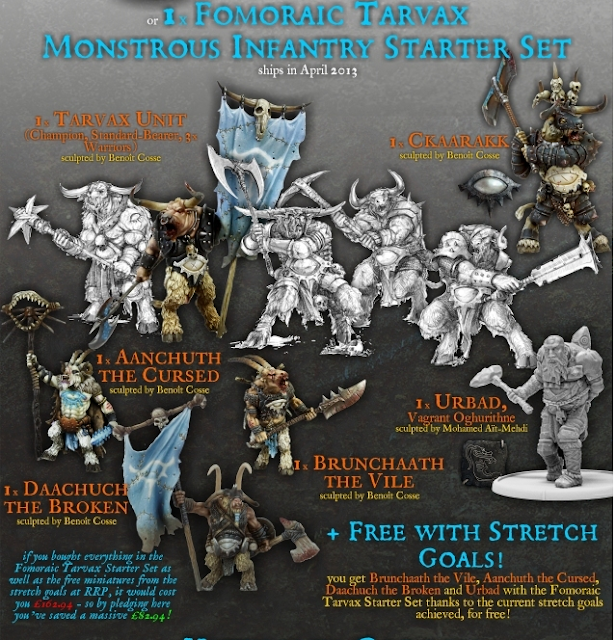 Mierce Miniatures Kickstarter ships next week and I am expecting the "Minotaur" Starter Set in the next fortnight. I ntend to use these as the basis of a Big Beasty army. Love the models and while a monstrous Beastmen army is not the most competitive, it will look cool. Last thing this week revolves around upcoming events. I have to submit a list for NiCon before tomorrow evening. James Brown has grudged me in the first round. I'm not usually one for grudge matches but accepted because we have never played before and selfishly, it is one less possible match versus Dwarfs. Also I have been drumming up support for Horned Rat. We now have just on two dozen players. With Earlybird registration finishing Saturday I am hoping we will exceed 30 players. It's a chance for the High Elf players to try out their new book in anger....well if not in anger, at least in mild irritation. There is minimal comp at the event (and none on High Elves) so come and play Warhammer how it's meant to be playrd. Always good to get more hobby done. Taking the Skaven to NiCon? Takes awhile to warm up new dice before they will show you any love. Looking forward to seeing the beasties together.